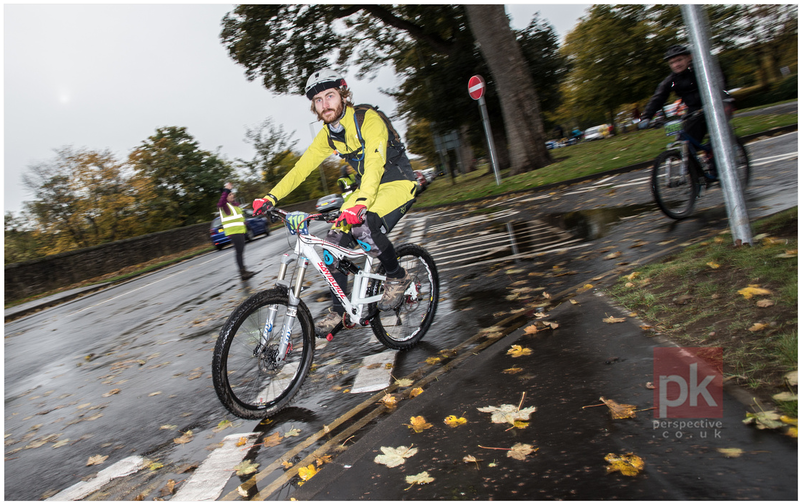 The Fair City Enduro offered a change of race discipline in a low pressure race to test myself again. I haven’t raced this year, not properly, more important family matters where at the front of my mind with the arrival of my son. Once bitten by racing though its a tough itch to scratch, so a one day enduro an hour 30 from my house provided the right opportunity and hard to resist. Having made it through the spring and summer with less riding and gym work than previous years, my fitness was a slight concern. I hadn’t gained weight but my base level was down on what I was used too so training would have to be tougher and concentrated to get me race ready. This, thankfully, was enduro, so a new approach to training was on the cards anyway. With my weekends happily occupied by the wee man it was the gym at work, so short and regular sessions focusing on strength training and sprint intervals on the spin bike. Gone were long training rides at 3/4 gas in were brutal visits to the pain cave pushing 100%, why does everyday feel like leg day? reminding myself that it wasn’t meant to get easier I was meant to get better. I was however, very aware that my pace would be down, I had been at skills coaching sessions at the start of the year and felt that my pace was up in the spring, but time off the bike I knew had dulled that edge, by how much we would find out. The night before the race brought on rain of biblical proportions, so as I loaded the bike up in the dark and dreich I like many of the riders was unsure of what conditions would await us on the hill. Jonathan McConnell and myself waiting for our starting wave. as I loaded the bike up in the dark and dreich I like many of the riders was unsure of what conditions would await us on the hill. 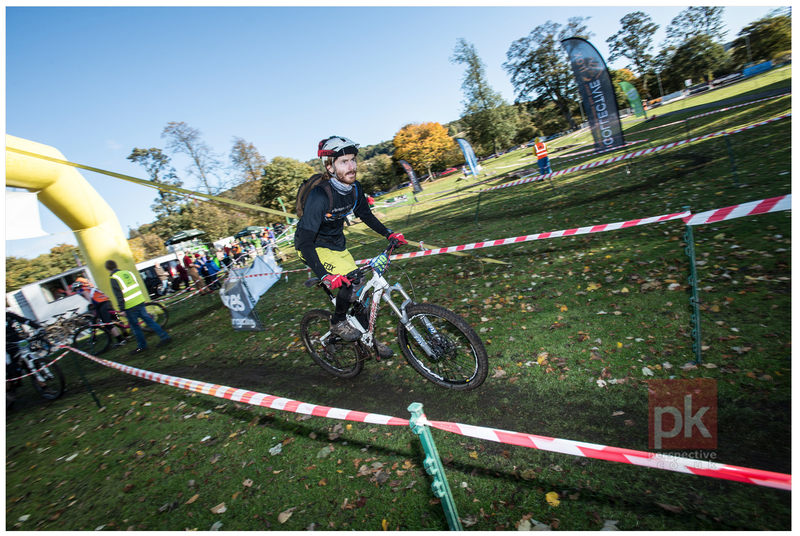 The event was organised by Muckmedden Events, they put on a fun easy going race with an encouraged fancy dress dress code, apart from the usual bottle neck on the first lap/stage you always have with races with 300 + riders the event was well run and supported. With only the occasional issue with taping on transitions causing some pilot error on my part inbetween stages, I enjoyed cutting the tape and “enduro lines” that this race format can be infamous for being on the transitions rather than the stages. The first stage had the usual nerves but I shook them off as there was long sight lines and the dibber was manned by a marshal so it was fast out the blocks. It was flat cornered and loose but not particularly steep, having been told this race hadn’t had much tech in past years I was expecting this sort of terrain. all was going well when on a soft going sprint section boosh, I slipped a pedal. Struggling to keep momentum and clip back in at the same time I cursed at forgetting to adjust the spring tension on my new SPD’s and battered on to the finish. My prep had let me down showing how easy it is to loose significant time on a short stage due to the tiniest of things. The climb up to stage two was a sociable affair which is probably why I didn’t notice how much height we had gained. Lulled into a false sense of security by stage one I dibbed in and sprinted hard out the start gate, keeping light on the bike and off the brakes hopping over roots and building speed when suddenly the trail flew into a tight left and into a steep loose chute, I was not expecting this. I slipped out and essentially half tripod half slid down the chute, clipping back in I was well aware that this stage was done for me (as was the race) but I was determined not to be overtaken by the rider 30secs behind me. My expectations well and truly adjusted for the days trails I dropped into a bike park section with some berms and tabletops before drifting to the end of the stage. That was fun but my race brain was still not thinking for Enduro, I reminded myself this was not a lapped course; this was not a point to point raced over hours and there simply was not the scope to gain back lost time, with this in mind I moved onto the next stage. Stage three shared the same start point as stage two it was just the other side of the hill, spinning hard off the start popping over roots and working the bike to keep momentum I now knew if I couldn’t see the exit of the turn it was probably a drop and it was. Prepared for it this time I dropped in and down seeing a climb immediately after I smashed through the gears and kept my speed up the climb. I closed on the rider in front of me and made it past them during the climb, swooping into the downs again a marshal shouted “rider down”, I knew they were ahead of me but I didn’t know where. Checking my speed but not wanting to lose too much when it was going so well, I kept on the gas feeling the acid build in my legs as the trails turned bone dry and dusty. I passed the downed rider on a flat sprint before dropping back into tight trails drifting the last few pine needle covered turns before dibbing out. I was absolutely beat breathing hard with fire in my legs it had been an incredible stage, I was the last rider down before they closed the stage to clear to injured rider which gave me ample time to recover whilst waiting for my riding buddies. The transition to stages four five and six was the longest and most scenic with the weather having a dramatic change of heart over the course of the day, with glorious sunshine breaking through the technicolour forest canopy, it was a great day to be on the bikes. The top of stage four was open ground with some rock slabs before the tree line, the marshal said that there was a corner just as you entered the trees, it was flat, grassy and wet and everyone was sliding out on it so watch yourself. The open start gave lots of free speed which continued into the trees With the crash corner ahead I scrubbed my speed, swung my hips and carved perfectly round the turn. Letting loose the anchors I cranked hard enjoying the playful feel of this trail, as I braapped through a speed section before approaching another flat turn. Scrub, Swing, Sideways, slide on my arse, the marshal hadn’t told me about this corner, but why should he this was blind racing after all! What had been perfect before led to me sliding out and tangling my foot in my chain. Starting from zero on a wet sprint I made it to the end without further incident. Back up for stage 5 and to bit of a queue who were having a pow wow about how best to start this trail, on the right there was a smooth line to the right with zero tech, not particularly fast and a good bit longer than the main line. To the left was a greasy steep rock chute with plenty of scope to grab a wheel, this set up straight into a sweet speed section before you disappeared into the trees. A number of riders wrote it off and went right thinking better of the slick rock, to be honest it wasn’t a particularly techy section and was very similar to parts of my favorite home trails. I spotted my line clipped in hollered “ALLEZ” and with a few crank turns the rear wheel buzzing my shorts I was down and whooping through the trees. This was a fast trail with slick muddy grass everywhere, the flat turns of stage 4 fresh in my mind I scrubbed speed and drifted turns trying to not get too rowdy. At the bottom with a clean run I was happy but knew there was still one last stage and it was going to be a long one. On the climb up to stage 6 I wound my Fox Talas down from 160 too 120 and powered my way up, the queue at the start was short so I started eyeing down the trail before it was my turn to drop in. Sprinting into the broom that flanked the narrow trail as it ran along the cliff Tops, with flashes of exposure to my left weaving through the trees the trail was fast, grippy and absolutely prime. The first steep chute had a sweet catch berm at the bottom, getting over the back wheel flowing into the drop the front end was twitchy and vague as I wrestled the bike through the turn. The handling felt very odd just then but shaking it off as just loose dirt I cranked it as the trail started to climb and contour the cliffs. Another steep chute with a drop to pop off approached, pre-loading the bike the front end wandered understeering over the drop, this was getting strange. My confidence in my usually unshakable steed well and truly shook I took the remaining trail with less commitment than was needed and less speed than previous stages, frustrating as the trail was amazing and the dirt prime. Dibbing out I hung my head leaning over the bars, looking down I saw the cause of all my woes, my Talas was still set to 120mm. If the head angle was any steeper my bike would of fallen over, never mind robbing the fork of any hard charging abilities severe school boy error. Rolling back into town the bonus stage awaited us, stage seven consisted of a flat sprint course with wooden rollers and berms as obstacles, it was in the event village so the spectators where out in force as was the heckling from the commentator. Falling over the finish line in a surprising amount of oxygen dept I handed over my dibber to be given my stage times and a flapjack, I don’t even think I saw the flapjack it was eaten so quickly. It had been a great day of racing but it had been a school day, I knew exactly where my pace was compared with myself earlier in the year, comparatively this was probably my worst placing within my category. But I knew a change of discipline would be a hard one to manage, with a few years of lapped and long races worth of training and strategy wired into the legs and mind the days results where always going to weaker than previous races. With a few key repeat offenders on my events to do list for 2016 I think there will be at least one enduro joining them. Bring on next year and more Enduro.